Live Tribute from Las Vegas! March 23, 2018, 7:30 pm. If you saw Dave Halston's Tribute to Frank Sinatra last year at Old Town Theatre, you know what a tremendous talent he is. All we had to do was close our eyes, and Dave transported us back in time. We could hear Ol' Blue Eyes himself singing to us from the stage! If you missed that concert, don't miss this one! Dave will be back at Old Town Theatre in March – and he's bringing some friends with him. 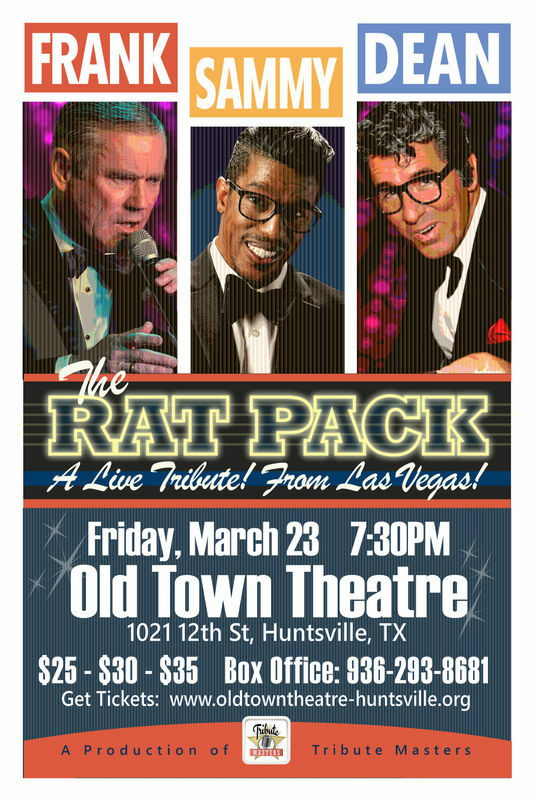 Get ready for a pack of music and laughter with one of the most celebrated Rat Pack tribute shows ever to grace the stage. This salute to Frank Sinatra, Sammy Davis Jr. and Dean Martin is a critics choice! The show features three of the most accomplished and sought-after Las Vegas entertainers in the business. Dave, Tom Stevens and Dezon Fields provide a captivating blend of swing, swagger and antics, and this show is an energizing spectacle that delivers “Old School Cool” like never before! Join Us at 6 p.m. for FREE Reception with a SURPRISE Vegas Celebrity!